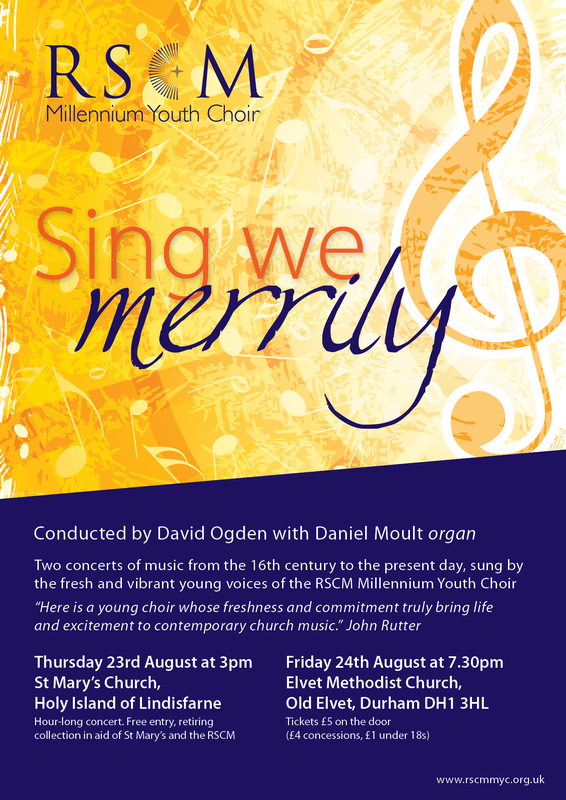 Come and enjoy two concerts of music from the 16th century to the present day, sung by the fresh and vibrant young voices of the RSCM Millennium Youth Choir, conducted by David Ogden and accompanied by professional organist Daniel Moult. The first is an hour-long concert in the church of St Mary Virgin, the oldest covered building on Holy Island, reputed to stand on the site of the original monastery founded by Aidan in 635AD. Entry to the concert is free, and there will be retiring collection to be divided between the choir and the parish church. 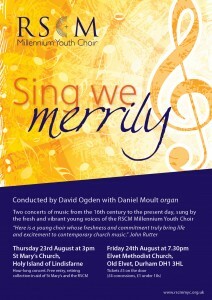 The second concert will be given on Friday 24th August at 7.30pm in Elvet Methodist Church in Durham, during which the choir will sing a programme of music showcasing its wide repertoire and versatility, from 16th century Italian Renaissance music to pieces written in the last 12 months. Tickets will be available on the door, priced at £5 for adults, £4 concessions, £1 for under 18s. During the week, the singers can also be heard singing Evensong at Durham Cathedral (daily at 5.15pm from Monday 20th to Saturday 25th August, except Thursday), and Sunday services at 10am (Matins), 11.15am (Sung Eucharist) and 3.30pm Evensong.